U.S President Donald Trump walks past soldiers during a visit to U.S. Central Command at MacDill Air Force Base February 6, 2017 in Tampa, Florida. Sgt. Alan Belser/Zuma Press/PA Images. All rights reserved. The first quarter of President Donald Trump’s mandate has shown that “America First” motto is, in reality, “Warriors First”. 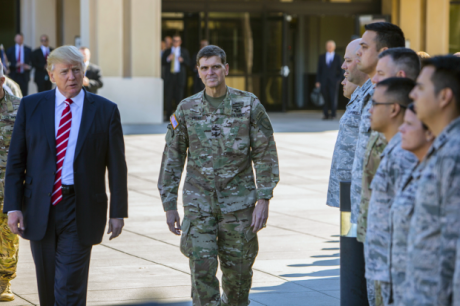 Since January 2017 the United States emphasis on military muscle, country-censuring, and pugnacious posturing –an emphasis that was already evident since the end of the Cold War and even more after September 11— has been accentuated. Trump is not an isolationist but a President willing to deploy its own version of primacy in times of eroding US hegemony. If primacy can be summarized as a grand strategy by which Washington does not tolerate, and must prevent, the rise of a serious challenger to US preponderance, then President George W. Bush played it vehemently, President Barack Obama tried to somehow calibrate it, and President Trump opted for an arrogant and aggressive version. Several indications point in that direction. The first quarter of President Donald Trump’s mandate has shown that “America First” motto is, in reality, “Warriors First”. First, the military presence is notorious in the cabinet. They are central figures in the Department of Defense (General Mattis) and the Department of Homeland Security (General Kelly), and at the National Security Council (General McMaster). Persons linked to, and involved with, the defense industry and lobbying hold relevant positions: among others, Heather Wilson (Department of Defense), Ben Cassidy (Department of Homeland Security) and Keith Kellogg (National Security Council). Hardliners of different class are key officials in the administration: anti-marriage equality, against transgender rights and planned parenthood, and pro-defunding HIV/AIDS programs Mike Pence (Vice-President), global warming denier Scott Pruitt (Environmental Protection Agency); climate change denier Mike Catanzaro (National Economic Council); pro-drug war and anti-immigration Jeff Sessions (Attorney General); supporter of immigration restrictions Julie Kirchner (Citizen and Immigration Services ombudswoman); staunch trade critic Peter Navarro (National Trade Council); and torture and abuse defender Mike Pompeo (CIA). Second, the administration has decided to increase the defense budget by US $ 54 billion while cutting in items like education, health, environment, as well as international non-military assistance. In addition, and according to the network of civil society experts Forum for Arms Trade, the Defense Security Cooperation Agency, with the blessing of the Department of State, notified Congress a record of arms sales in the first four months of a government: US$ 9257.7 millions. Further more, President Trump signed a US$ 110 billion arms deal with Saudi Arabia’s autocratic regime of King King Salman bin Abdulaziz Al Saud. The administration has decided to increase the defense budget by US $ 54 billion while cutting in items like education, health, environment, as well as international non-military assistance. Third, the Trump administration is very probably the least attentive on international human rights and democratic issues since the end of the Second World War. Human rights defense and promotion are neither vital nor secondary interests in US foreign policy. It is not a question of pure realpolitik or utter open amorality; it may be the result of a more complex and contradictory process that has to do with the gradual deterioration of US democracy at home and its projection abroad. 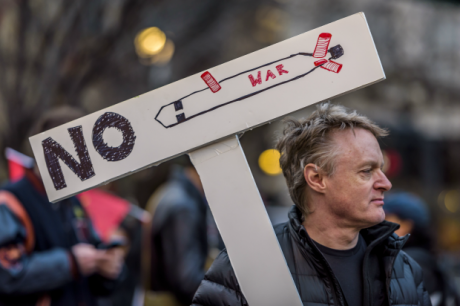 People protest on Friday, April 7, 2017 against the Trump Administration's military involvement in Syria. Erik McGregor/SIPA USA/PA Images. All rights reserved. Fourth, and with no significant strategic purpose nor military impact, the Republican administration launched 59 Tomahawks missiles on Syria and the so-called "mother of all bombs" (MOAB in its acronym) over Afghanistan. Interestingly enough, new right-wing crusaders, old neoconservatives, and traditional liberals seem to agree on the utility of force per se, without any long-term military or political value. The Trump administration is very probably the least attentive on international human rights and democratic issues since the end of the Second World War. Fifth, Islamophobic language, warmongering rhetoric vis-à-vis Iran, leaks regarding a potential, unilateral military action against North Korea, Mexico-bashing, open criticisms of European allies such as Germany, ominous warnings for NATO, threats to terminate trade deal with South Korea, ambiguity with regards to post-conflict aid to, and support for, Colombia are, for example, regular comments and attitudes, both private and public, among high ranking government officials and the President himself as if bombastic, belligerent brinkmanship has become Washington preferred style of dealing with foes and friends alike. Sixth, the Trump administration looks obsessive to be tough: tough on trade, tough on ISIS, tough on borders, tough on crime, tough on foreigners, tough on war, tough on enemies, tough on Cuba, tough on partners, tough on the environment, tough on China. But these fixations are not signaling the capacity to sustain and advance a realistic grand strategy; they are the symbol of material weakness, political disorientation, and misguided willingness. Thus, in the end “Warriors first” is just a recipe for crisis, both domestic and international. Thus, and paradoxically, it is not that Washington should be more alert about what happens in the world; it is the world that should be concerned with what is going on in the United States.